Architect Esther Sperber, the daughter of a Talmud scholar, draws on the poetics of space as well as creative problem-solving—two of architecture’s key concerns—for her work with Jewish organizations and beyond. In 2008, she won a competition to design the Kesher synagogue in Englewood, New Jersey (unbuilt). Beginning with the community’s name, meaning knot or connection, she organized her design around the concept of continuous connectedness, creating a network of ramps to aid members of different ability levels in accessing the sanctuary on Shabbat without the aid of an elevator, a priority for the Orthodox congregation. For ornament and texture, Sperber incorporated the evocative beauty of Hebrew script, bringing the centrality of text in Jewish life into physical form. Her design carves the structure into the surrounding landscape, resulting in an L-shaped sanctuary that creates women’s and men’s sections in a non-hierarchical orientation, each enjoying open vistas and natural daylighting. 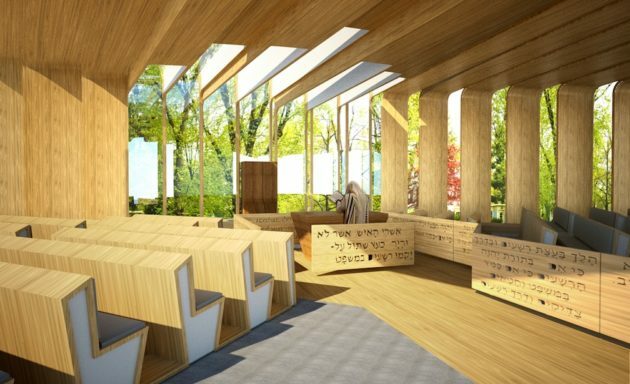 For the Fort Tryon Jewish Center (in progress), Sperber was invited to reorganize the community’s sanctuary, a cavernous and unapologetic remnant of another era in communal life, featuring row upon row facing unilaterally toward a disconnected bimah. The space, now used by groups of various scales, called for a solution that would feel comfortable during intimate minyanim as well as community-wide events. Sperber took her inspiration from pages of Talmud, wrapping benches and movable chairs around a central kernel, the bimah, working outward from the center and creating a cocoon of seating that can function as seamlessly with small groups as with a surging crowd. Jewish architects are among the best-known figures in the past century, men like Louis Kahn, Frank Gehry (né Goldberg), Marcel Breuer, and Daniel Libeskind. Among Jews, women are known as some of the most outspoken individuals, which makes their absence from this list even more surprising (apart, of course, from Denise Scott Brown, famously snubbed from her partner’s Pritzker Prize). What explains the shockingly low proportion of women in architecture? And does this intersect with Jewish identity? The paucity of women architects is a question the field is asking itself, if at times uncritically. The issue of work-life balance is dear to anyone with a job in the current ever-more-demanding economy, but particularly pivotal for women, on whom the greater household and childcare burdens continue to fall. In Jewish culture, with the centrality of family life, the choice or necessity to extend oneself in the professional sphere becomes more fraught, with the “leaning in” prominently contrasted with what exactly individuals are “leaning away” from. Like other intense professional programs, architecture school admits to being “trial by fire.” The philosophies of architecture are far-reaching: the embrace of a rational futurism, the all-consuming mission of the artist, the deep aesthetic and economic analysis of the urban environment that is invisible to non-practitioners. The parallels to religion are right there: reverence for a tradition and its luminaries, a strict system through which meaning is created, and a lifestyle of personal discipline offered up to a greater good. Sound familiar? In this light, it is not surprising that many Jewish architects practice architecture religiously and Judaism culturally, although the Jewish religious tradition does have plenty to say about space. (Think ancient Mishkan and modern-day sukkah). Luck is harder to count on than hard work, and for many, it must start long before the start of a career. The issue of economic privilege is particularly striking in architecture, where an average starting salary is just over $44,000 per year, following an investment in schooling that typically runs as long as law school, followed by a training period as long as medical residency. This is simply impossible for many people without financial safety nets, particularly women whose childbearing years often coincide with the early, pivotal period in their careers. Setting aside the conflict between trainees’ long hours and parenting obligations, the cost of childcare is simply out of sync with intern architects’ salaries. This is a common struggle among women wage earners but less commonly discussed for highly trained professionals. Unlike Braverman, whose independent studying reinforced her natural confidence on job sites, Wolff has encountered hostile situations within construction management. In one instance, a contractor used the wrong hardware, then flatly denied wrongdoing, telling Wolff that she must have misunderstood which one was which. Worse than having to tell the contractor that he was wrong, a situation that every architect encounters, Wolff had to confront his willingness to lie, intimidating her to avoid her supervision. Wolff sees managing these micro- and macro-aggressions as an unfortunate but integral part of her job. In Wolff’s case, the risk has begun to pay off. While two Harvard students were protesting the Pritzker Prize’s exclusion of Denise Scott Brown, Harvard Graduate School of Design selected Wolff, who graduated from the school in 2008, for the inaugural year of its newly expanded Wheelwright Prize, a two-year $100,000 fellowship for an emerging architect. Wolff believes she was chosen because of her collaborative work with architects and artists across disciplines—a non-traditional route through the career. While prize-winning is not a scalable solution for the field, recognizing women’s contributions in architecture begins to redress the enormous gender disparity in the visibility of women architects. Melissa Tapper Goldman uses technology, design, media, and writing to elevate collective assets and talk back to those who have it coming. More at alliedfields.com.